Whee! 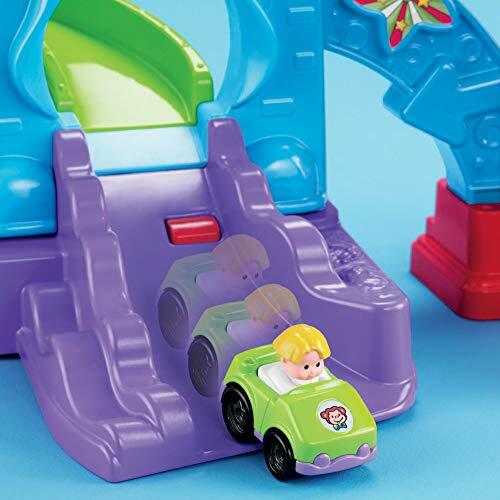 It's the Fisher-Price Little People Wheelies Loops 'n Swoops Amusement Park--an action-packed, mini-vehicle toy for fun-loving kids ages 18 months to five years. It's over two feet tall, so the Wheelies vehicles can really zoom down each of the two roller coaster ramps. Plenty of lights and sounds as the Little People "ride" around with gravity-defying loop-the-loop action and more! 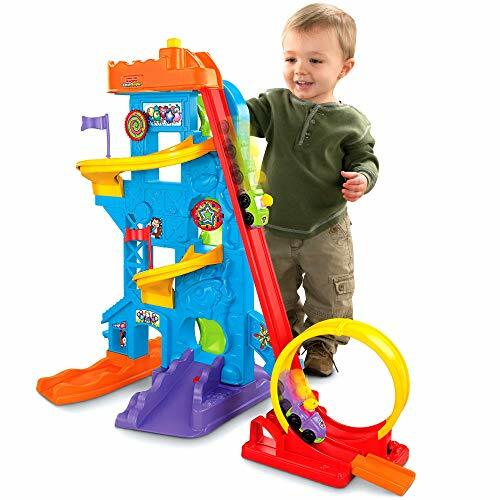 Loops 'n Swoops Amusement Park stands over 2 feet tall. .
Push button for easy-release down to the loop-the-loop! Star spins when car drives under monkey! 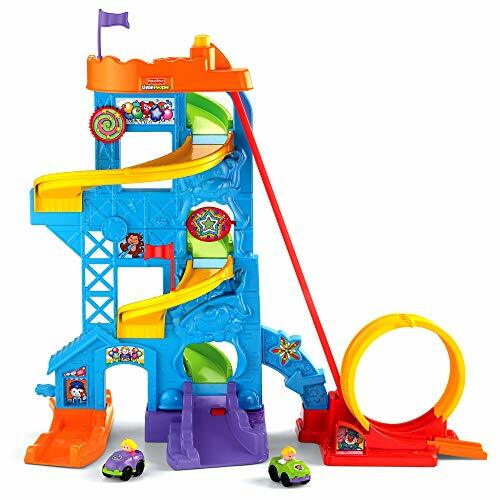 The Fisher-Price Little People Wheelies Loops 'n Swoops Amusement Park is a two-sided, double-track rollercoaster play set that delivers tons of action-packed vehicle fun. With this brightly-colored, 2-foot-tall tower, your child will go on endless wild rides--in their imaginations! And there are plenty of lights, sounds, and songs to keep him or her enthralled. 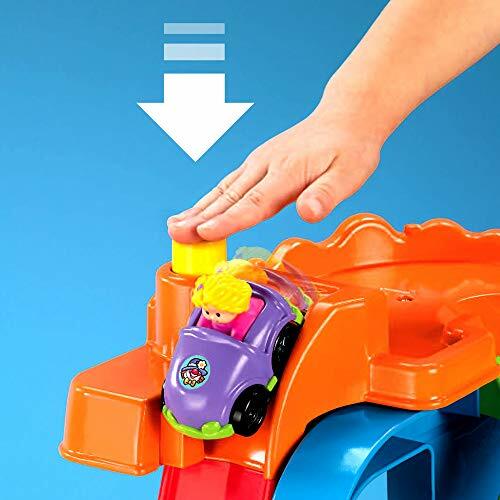 A simple push-button easy release starts the car's roller-coaster action and sends it flying down the ramp. Zooooom! It passes under the monkey arch and activates a spinning star. On it goes, making twisty hairpin curves past waving flags to the finish where the vehicle magically activates more star-shaped lights and fun sounds. And that's not all -- there's double fun with this toy! For real thrill-a-second action, your little one can send a Wheelies vehicle speeding straight down the tall ramp to finish with a 360 degree loop-the-loop! Still want more fun? Lift up the jump at the end of the loop and see the vehicle go flying! Beep! Beep! Ding! Ding! Vroom! Vroom! 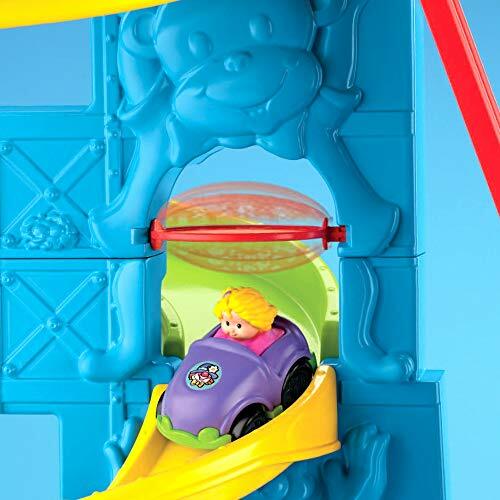 The 2- foot-tall Fisher-Price Little People Wheelies Loops 'n Swoops Amusement Park is anchored by a rolling ramp that's filled with twists and turns, ending with a gravity-defying 360 degree loop-the loop! Flashing lights, sounds, and a fun song keep your little one interested for countless visits to this park. The bottom level has a ticket booth, fun house mirror, food stand, lift gate, and other amusement park details. 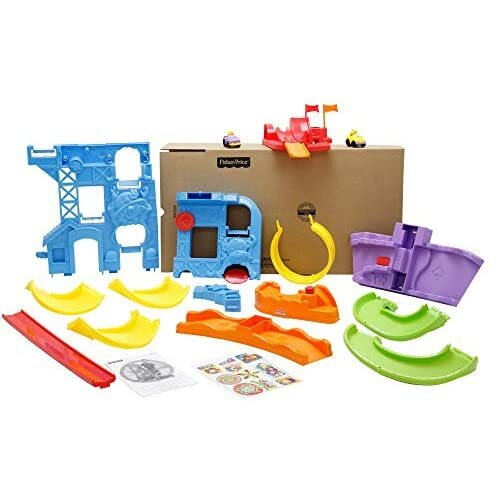 Fisher-Price Little People Wheelies Loops 'n Swoops Amusement Park will challenge your children and help them develop fine motor skills as they use their fingers and hands to grasp, hold, open, close, push, and turn. Little ones gain confidence as they make things happen, sending Wheelies vehicles zooming down the two ramps and activating the jump to send vehicles flying. Like a real-life amusement park, this one has lots choices to make, lots of sounds to hear, and lots of things to be curious about--like gravity, speed, and distance. Amusement park and two Wheelies vehicles.